The key point on our shopping list for our own home this year was a backyard. It didn't have to be big, just big enough. 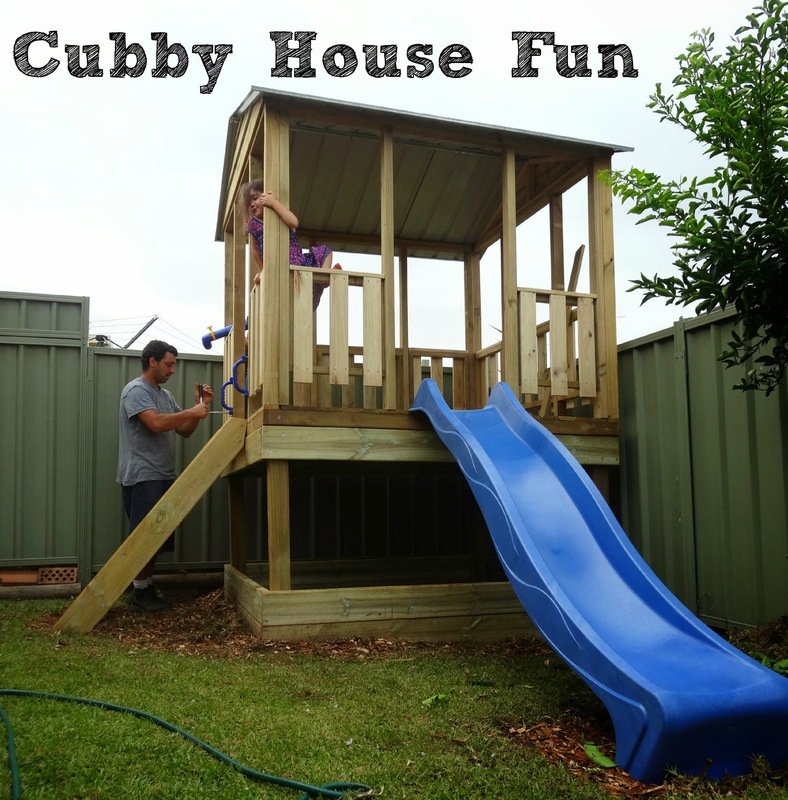 Big enough to eat outdoors sometimes, big enough for our swing set, but most importantly, big enough for a cubby house. 13 year old Madeleine was given her own cubby house at our first home when she was 3. Having it for so many years, so many birthday parties and play dates, it was the main thing we regretted leaving when we made our rush decision to move early last year. With Sebastian and Lorelei so little at the time, it was sad to think they would never enjoy the cubby house that Maddy had loved so much. We were absolutely overjoyed to be able to get into our home this year with plenty of time for Christmas. Over and above anything else we could do for Christmas, we wanted to get the little ones a new Cubby. They're an expensive gift, but our logic has always been that the earlier we buy it, the more years it gets used for making it better value the longer we own it. I shopped around for a while, looking for an open fort on stilts with a slide and a sandpit beneath. There were lots out there, we eventually I found the best price (including shipping) not too far from home. WA has HEAPS of cubbies at great prices, but once shopping to NSW was added it wasn't worth it. Before I made my purchase, I quickly checked eBay, and was surprised to see the same fort for sale - $150 cheaper Buy It Now! The same business had their stock on eBay at a lower price, which makes no sense to me since they have to pay ridiculous eBay fee's, but I bought it through the eBay channels anyway for $1695 including freight. We had hoped that we could have it erected secretly by Christmas Eve, but even after 3 days of stealth work when the little ones were either napping, out of the house, or being occupied by me at the front of the house, we were electrified when little Lorelei suddenly asked out of the blue "Can I go outside to play with my cubby?" I brushed it off casually hoping that she just meant her old little plastic cubby that she had seen in the garage, but the next day she busted us completely by randomly ripping up the blind in her room to look out at the cubby in all it's unfinished glory. We accepted the inevitable and let them out to it on Christmas Eve where they got to "help" husband finish building it. The Fort was a huge win. It made Christmas Day and Boxing Day for us. Our kids and all the visiting kids were crazy about it, all ages playing on it for hours. It's been same each day since with my little ones wanting to get outside as soon as they wake up. It's the best thing we could have bought for them - it meant that we went a little light under the Christmas tree with mainly gifts in the "Something they Need" category for the little ones (new preschool bags, PJ's, shoes etc) but there were some small toys for each of them to open anyway, along with a few items I won in various December Blog Giveaways, and they have absolutely loved having the cubby house so it was worth it! Hoping everyone else had a wonderful Christmas as well, ours was a super relaxing couple of days, we don't do too much rushing around for Christmas anymore, we mostly just host a handful of people. Watch out for a couple of great giveaways over the coming days, I have some passes for Sealife Aquarium that I will be putting on the blog soon! It's a beautiful cubby! Your kids will have great memories of this down the track.